Microfiber may be one of the most versatile fabrics on the market. It is soft, absorbent, durable and can be washed and reused for various applications. This multipurpose thick fabric, despite its nappy surface, remains amazingly low linting. TIDDOX supplies MICROFIBRE CLEANING CLOTHS measure 40cm X 40cm, so they are big enough to be useful without getting in the way. We supply these packs in 4 colours – red, green, blue, and yellow – so that you can colour code them if you want to. 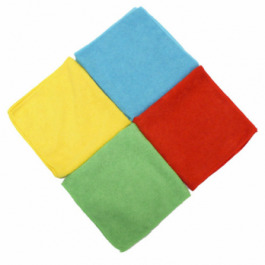 These microfiber towels are used primarily in the hospitality and automotive industries, but cross over easily into healthcare or mechanical use. They are soft and non-abrasive so they can be used when cleaning chocolate pudding from a toddler’s face, but tough so they can be used to scrub up ink spills in a printer’s shop. Perhaps best of all, these wipes are washable! You can wash and reuse these healthcare towels, but they are inexpensive enough that you don’t have to feel guilty if you just throw them away. The microfiber shines mirrors, glass, or stainless steel without leaving loads of lint behind, while the weaving of the fabric makes the fabric tough and durable. The towels come 10 to a pack, and you get 10 packs per carton. TIDDOX's MEDICAL MICROFIBRE CLEANING CLOTHS make one of the best medical cleaning products, offering a thick pile of absorbent material cut to a decent 40cm x 40cm size. Emergency medical departments and medical facilities also like the colour coding aspect of the products and that they have incredible absorbency capacity, whether its to staunch a flow of blood or urine, or to wipe down and clean equipment without leaving excess lint behind. In the emergency department, these medical wipes are soft enough to be used on the skin but tough enough to be used to scrub up a dried stain. A versatile, general purpose microfibre cloth for easy use. CAR CARE MICROFIBRE CLOTHS are one of the best materials for shining and detailing a car. Your car wash is the best place to find out just how handy these towels are. The microfiber is perfect for shining windows, mirrors, and chrome, and absorbent enough to leave a shine behind, instead of streaks. Most industries need something in the work area for spills and cleanup. Many industries use the microfibre products for shining the finished product or prepping surfaces. TIDDOX's INDUSTRIAL MICROFIBRE CLOTHS have the right texture to shine work surfaces of finished products, yet are made of low-lint material so that finely-tuned machinery won’t be messed-up with debris. Say goodbye to the “Bags of Rags!” Your mechanics will never want to use any other kind of towel. These AUTOMOTIVE MICROFIBRE CLOTHS will soak up any spill, from antifreeze to grease. Is there a leak under one of the cars? Drop one of these towels on it, and it will contain the mess until you get back to it. The hospitality industry depends heavily on reusable, absorbent, soft cleaning HOSPITALITY MICROFIBRE CLOTHS. These towels are bought in bulk for hotel housekeeping, restuarnt and commercial kitchen use, and by pubs, clubs and bars to maintain clean counters and surfaces. Whether you work in an an aged care facility or a daycare, you probably go through a lot of towels every day. Wouldn’t it be nice to have a wiper that can do everything? Our HEALTHCARE MICROFIBRE CLOTHS are absorbent, soft, and tough. You can clean up the dining area or soak up spills. Order them today, and you’ll want to keep them in stock.